Hip replacement, also known as arthroplasty, is a surgical procedure in which a damaged or poorly functioning hip is removed and replaced with new, prosthetic parts. Hip replacements are generally indicated as last-resort treatments for pain caused by osteoarthritis or joint failure. The intended outcome of hip replacement surgery is to reduce pain and increase mobility. Some hip replacement implants are designed to last for up to 20 years, although some models have shown early signs of complications and have been the subject of recalls. Doctors generally resort to hip replacement surgery only after other non-invasive treatments, such as walking aids, physical therapy, anti-inflammatory drugs (such as corticosteroids) and pain medications have not produced acceptable results for the patient. Depending on the type and severity of joint failure, a number of different kinds of hip replacement surgery may be indicated. In addition to osteoarthritis, other conditions that may lead to the need for hip replacements include: rheumatoid arthritis (a chronic inflammatory disease that causes joint pain, stiffness, and swelling), avascular necrosis (loss of bone caused by insufficient blood supply), injury, and bone tumors. 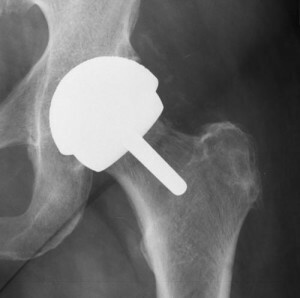 Total hip replacement: The entire structure of the hip is replaced with artificial parts. The hip socket, also known as the acetabulum, is replaced, as is the femoral head of the thighbone (i.e. the “ball” that fits into the “cup” of the hip socket). In some procedures, the artificial femoral head is attached to the thighbone using a cement-like adhesive, though some newer cement-less versions of the surgery attempt to stimulate bone growth so that the implant and bone become naturally fused. Partial hip replacement (hemiarthroplasty): A less comprehensive version of total hip replacement, in which only the hip socket or the femoral head is replaced with prosthesis, with the other part remaining in its pre-operative state. Hip resurfacing: Only the surfaces of the hip joint’s ball and socket are surgically enhanced. The damaged surface of the femoral head is reshaped and covered with an artificial cap, usually made of synthetic metal. In some cases, the hip socket may also be capped with a metal covering. Hip resurfacing is meant to conserve the integrity of the overall hip structure, while allowing a smoother, friction-less, and less painful interaction between the ball and cup components. A variety of hip replacement systems have been FDA-approved for the U.S. market. These include hip replacements constructed of metal and plastic, metal on metal, metal and ceramic, and ceramic and ceramic. Metal and plastic: Traditionally the most common hip replacements, metal-on-plastic devices utilize metal components made of titanium, stainless steel, and/or cobalt chrome, lined with polyethylene. Though the plastic linings are meant to facilitate friction-less swiveling of the hip ball in the socket, they tend to suffer from more wear and tear than other types of hip implants, and have a briefer lifespan before needing to be replaced. Metal-on-metal: Intended to last longer than metal-on-plastic devices and to accommodate active lifestyles, some metal-on-metal systems have been the subject of hip replacement recalls due to serious complications. These include metallosis, which is also known as metal ion poisoning. Metallosis occurs when cobalt and chromium metal shavings, created by the friction between the artificial hip’s metal ball and socket, are shed into the surrounding joint tissue and bloodstream. Metallosis can lead to extreme pain, inflammation, bone deterioration, metal toxicity, pseudo-tumors, and ultimately hip replacement failure. Ceramic-on-ceramic: Generally believed to be more scratch resistant and less prone to surface wear and tear than other hip replacement systems. Some models, however, have been associated with loud squeaking and popping sounds. Additionally, the long-term durability of ceramic-on-ceramic hip devices has not been adequately established through research. Metal-on-ceramic: The most recent formulation of hip replacements has only been used in the United States since 2011, and long-term determinations in regard to durability, effectiveness, and failure rates have yet to be established. Many hip replacements were cleared for sale on the U.S. market via the FDA’s 510(k) Premarket Notification Process. The 510(k) has come under criticism for allowing medical devices to reach consumers without sufficient pre-market testing to ensure safety and investigate health concerns. Hip replacements receive 510(k) clearance by demonstrating that they are “substantially similar” to previously existing devices. Though the FDA created the 510(k) policy to reduce red tape and allow the medical community to take advantage of new technological advancements as soon as possible, critics claim that manufacturers have used the loophole as a shortcut for bringing dangerous and untested devices to the market, thus endangering the safety and well-being of the public. A subsidiary of Johnson & Johnson, DePuy manufactures the ASR XL Acetabular hip replacement and ASR Hip Resurfacing systems, both of which have been the subject of recalls. DePuy also makes the Pinnacle Hip Replacement System. Released on the U.S. market in 2005, the ASR total hip replacement system utilizes a metal-on-metal configuration. Starting in 2008, the FDA began to receive hundreds of patient reports about problems with the ASR, including pain, immobility, loosening of the implant, and high levels of metal ions in the blood. In 2010, after 93,000 people worldwide were implanted with the ASR, DePuy implemented an ASR hip replacement recall after studies demonstrated unusually high failure rates. The British Orthopedic Association published research in 2011 suggesting that up to 49% of ASR hip systems would fail within 6 years of being implanted. Though the ASR hip resurfacing system was never approved by the FDA, it was used in an unknown number of U.S. patients, and has been linked to the same risks as the ASR total hip replacement system. This has resulted in thousands of lawsuits against DePuy Orthopedics. Unlike with the ASR, the components of the Pinnacle hip system may be constructed of a variety of materials (metal, ceramic and polyethylene). However, the prosthesis always uses a metal acetabular lining and metal femoral head. As a result, it has been linked to many of the same complications as the ASR, including premature failure and metallosis. Stryker is the manufacturer of the Rejuvenate Modular and ABG II systems, both of which were the subject of hip replacement recalls in 2012, after having been on the U.S. market for approximately 4 years. Stryker also manufactures the Trident hip replacement device, which was pulled off the market in 2008. Unlike traditional one-piece neck-and-stem hip replacements, all three Stryker hip systems— Rejuvenate, ABG II, and Trident—provide a selection of “modular” components that can be mixed and matched to best suit each patient’s unique anatomy. Despite their structural innovations, Stryker hips have been linked with complications such as squeaking and popping sounds, early device failure, corrosion and fretting, and metal poisoning. Stryker hip lawsuits have been filed in large numbers as a result. Zimmer Holdings Inc. makes a variety of hip replacement systems, including those utilizing the Durom Cup, Trilogy, and Continuum Acetabular components. Some Zimmer hip products incorporate Trabecular Metal technology, a synthetic metal intended to mimic the natural sponginess of the patient’s bone. Though Zimmer hip products have not been subject to hip replacement recalls, the company did temporarily suspend sales of the Durom Cup system in 2008 after receiving an abnormally high number of reports of premature device failure. After investigating the claims, Zimmer re-released the Durom Cup three months later with updated product information and surgical instructions. Thousands of Zimmer hip lawsuits are currently pending in state and federal courts. Other prominent hip manufacturers include Biomet, Smith & Nephew, and Wright Medical. Biomet’s hip replacement systems, including the M2a Magnum, Stanmore, and Exceed ABT, all use a metal-on-metal design, and have been linked to complications involving the excessive shedding of metal particles into hip joint tissue. In 2012, Smith & Nephew recalled the metal liner used with its R3 Acetabular hip implant, calling it a “precautionary measure” after receiving an abnormally large number of reports regarding device failure. Wright Medical has had the most success with its ceramic-on-ceramic hip replacements, though Wright’s metal-on-metal products, the Conserve and Profemur hip replacements, have generated concern in the orthopedic community because of device dislocations. Commonly reported problems with prosthetic hip systems, some of which have led to hip replacement recalls, include chronic pain, infection, inflammation, difficulty walking, reduced range of motion, difficulty squatting and sitting, bruising in the hip area, lack of balance, squeaking or popping emanating from the joint, immobility, and heterotopic ossification, which occurs when soft tissue becomes hard and inflexible. Many artificial hip systems have been the subject of adverse event reports from patients who have experienced serious complications from their devices. Hip replacement revision surgery is a second surgery required to remove the initial implant and replace it with new component parts. Revision surgery is traditionally considered to be a more difficult, costlier, and riskier surgery than the initial hip replacement procedure. An estimated 55,000 hip implant revision surgeries are performed every year in the United States. In some cases, revision surgery is performed when the natural lifespan of the hip—usually 10 to 15 years—has expired. Unfortunately, in many thousands of cases revision surgery for hip replacements is required only a few years after the initial implantation, due to premature failure of the device. Many patients who have experienced early hip failure have accused the artificial hip makers of designing, manufacturing, marketing and distributing defective devices. They have further claimed that many hip replacements were not adequately tested for durability and safety prior to reaching the market, and that consumers and their doctors were not adequately warned about the risks posed by their hip prosthetics. Hundreds of injured patients, especially those who have had to undergo revision surgery, or who received devices that were subsequently subject to hip replacement recalls, have filed hip replacement lawsuits against the manufacturers. Plaintiffs seek compensatory damages for pain and suffering, surgical expenses, and other costs, as well as punitive damages to punish manufacturers for allegedly acting outside the best interest of consumers and the public.